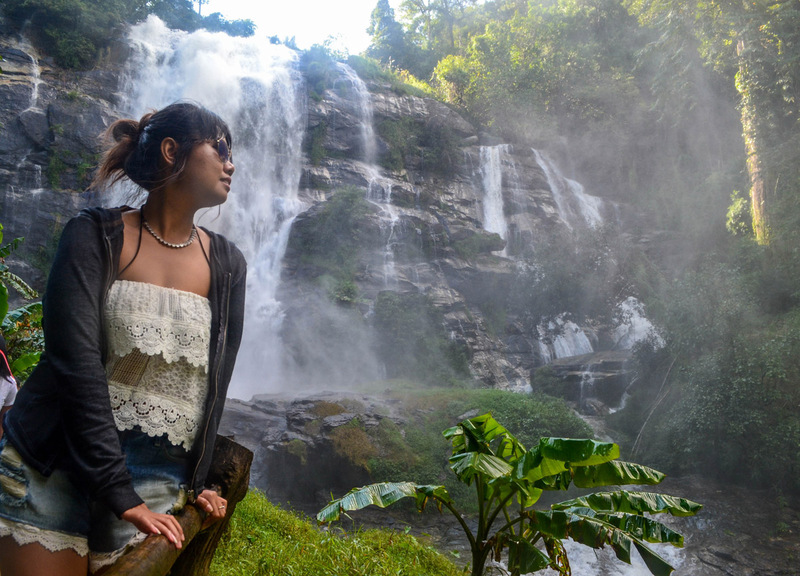 I would be torn between Chiang Mai and Chiang Rai as a base for travel in the north, but they do both have their own advantages and unique attractions. 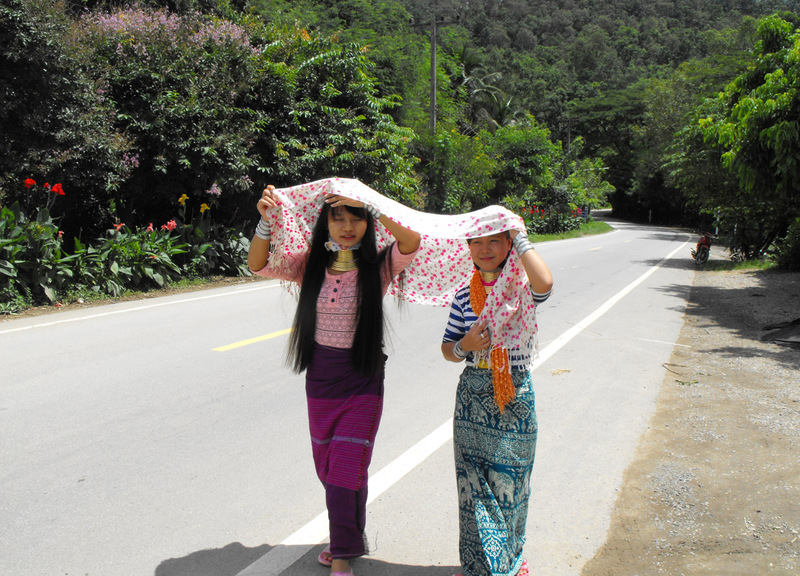 To date we have covered both regions fairly well, along with Mae Hong Son (Pai). 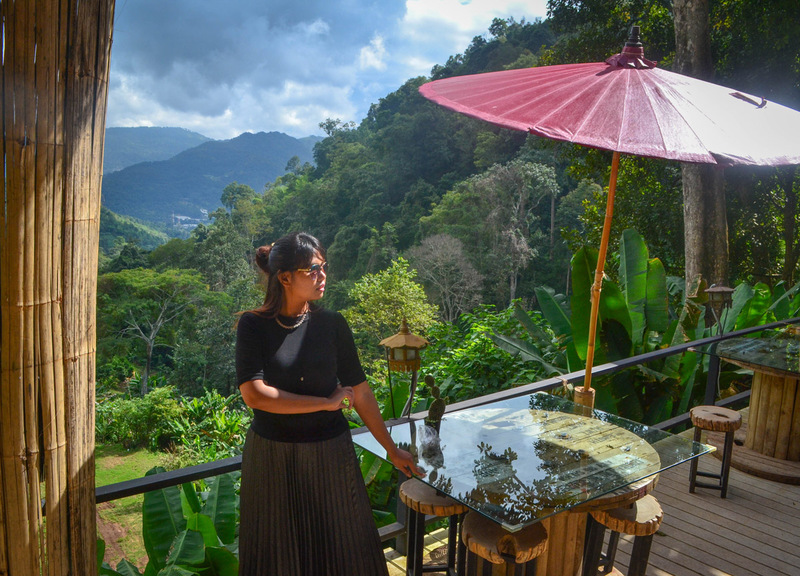 The best area to stay as a tourist would definitely be the old city area of Chiang Mai but, for those exploring further afield, a more amiable base for travels would be the Nimman area of Chiang Mai. 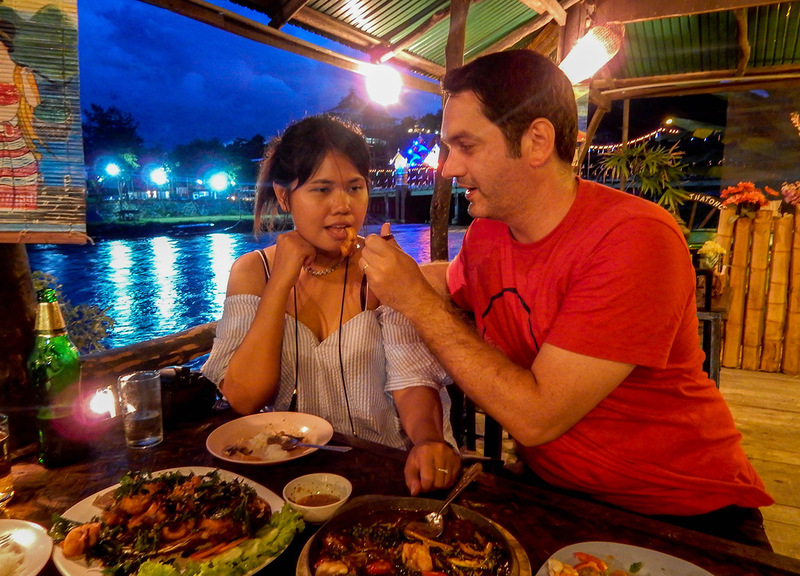 To help better decide HotelsCombined put together a blog on Where to Stay in Chiang Mai: Nimman or Old City. 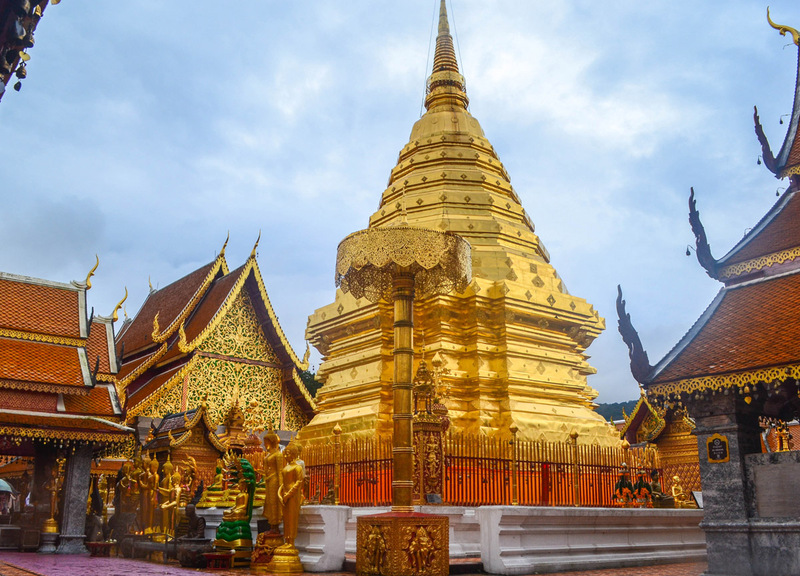 Either way, Chiang Mai’s old city is, without a doubt, worth spending some time, although it can be excruciatingly backpackish and touristy at times. So when the claustrophobia sets in I’d escape to the surrounding hills and mountains to explore the real charm of the north. To do this just rent a car, or motorbike, or driver, and go. 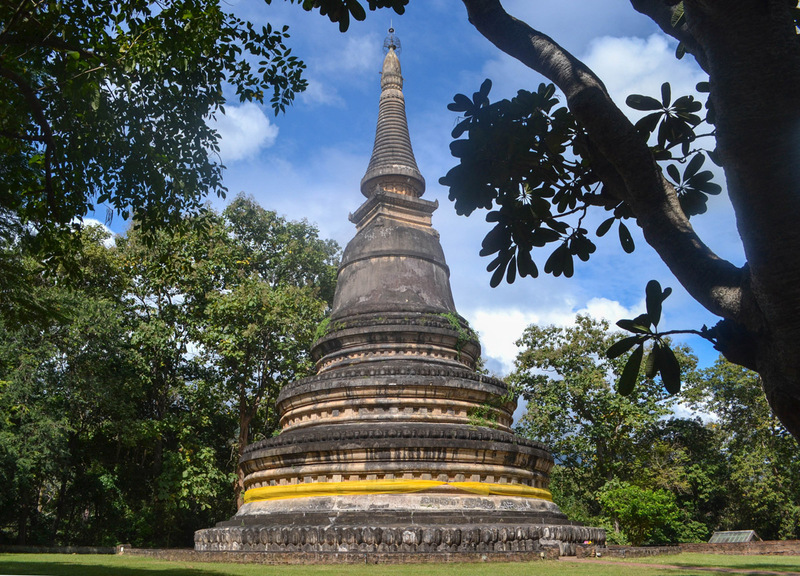 So these Top 10 attractions in Chiang Mai Province are all found easily within driving distance and, if looking for something more far flung, here are our Top attractions in the Chiang Rai Province. For these attractions I will have to start with food. 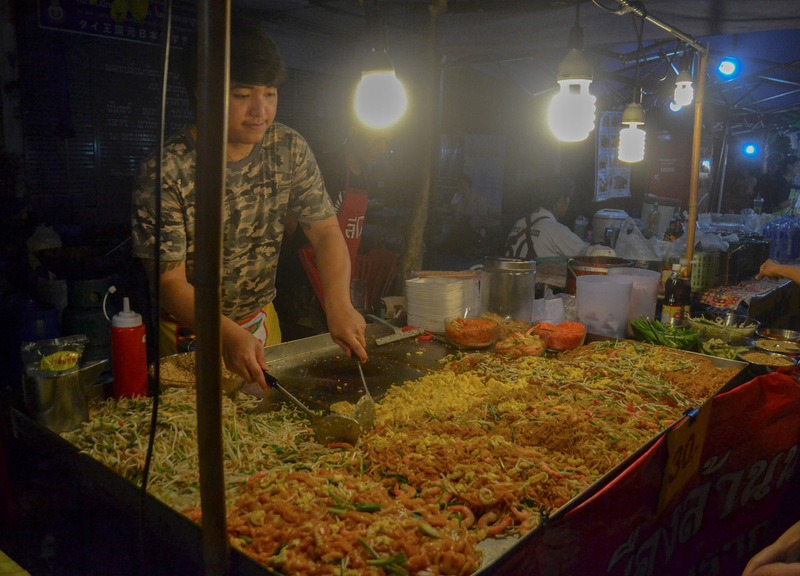 Food will vary at times in Chiang Mai where, in the border regions for example, Yunnan food will be common in parts. Think Pao buns (sala poa), shrimp shumai (khanom jeep), noodle soups and pots of tea. Otherwise it is Lanna Food which presides over Northern Thailand, often tricky to track down elsewhere, so make the most of it. 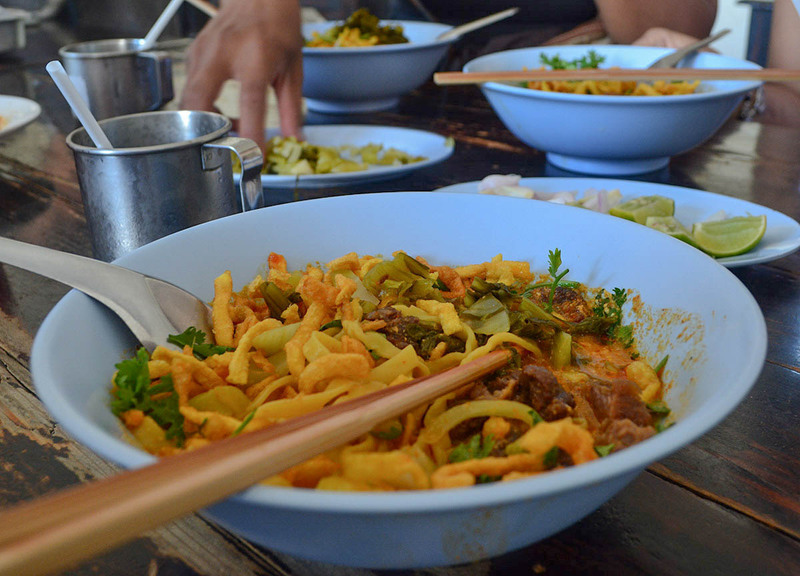 Lanna Food will be found throughout attractions in Chiang Mai, often served as Khantoke style sets and occasionally haunched at a small round table, or just served on a circular tray. Sets will typically include boiled vegetables with chilli dips, one of toasted green chillies (nam prik noom) and another fusion of red chillies and minced pork (nam prik ong). Also likely to be on the plate are spicy sausage (sai oua), a fruity pork curry (kaeng hang leh) and maybe some fermented pork (naem). And don’t forget the iconic street food bowls of curry noodles (Khao Soi) and Khanom Jeen Nam Ngiao (rice noodles in a rich tomato sauce). Temples seem to be at almost every corner of Chiang Mai but, on our more recent visit, we went out of our way to tour some of the more prominent and interesting temples. But I still have to complete this temple tour post so for now you will have to make do with a summary. 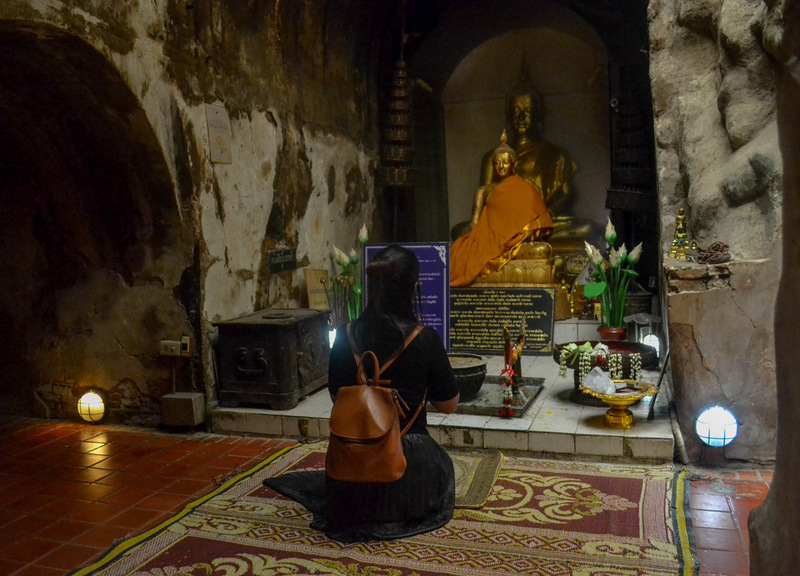 Some of my own personal favourites are Wat Phra Singh (Temple of the Lion Buddha), Wat Chedi Luang (Temple of the Big Stupa), Wat Phan Tao (Temple of a Thousand Kilns), and Wat Lok Moli. Google them. While there are more famous further flung temples in Chiang Mai, these handful are all found easily within the walls of the old city (which is where most attractions in Chiang Mai city are found). They could also be covered in half a day, maybe on foot (although motorbikes and tuk-tuks are obviously quicker). But do expect each of them to be busy and touristy which goes with pretty much every attractions within the old city walls. 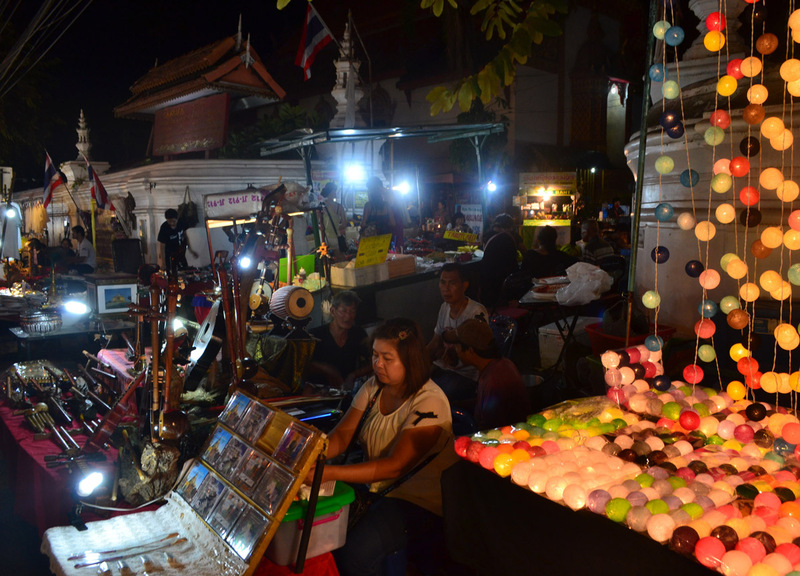 There are a bunch of night markets throughout the week in Chiang Mai but, the most popular would have to be the weekend walking street markets, where chunks of the old city are cordoned off to create pedestrian zones lined with stalls and merchandise. On Saturday night the walking street is found along Wualai Road, and on Sunday it is on Rachadamnoen Road, starting at Tha Pae Gate. These markets are, as expected, geared towards tourists and they do make for an easy introduction to northern things. From lanna food favourites, to the trinkets of hilltribes. There’s also the usual backpacker stuff like Pad Thai, probably henna tattoos, fisherman pants, muscle tops and funny hill tribe hats. Anyway, they should have the cliches covered. 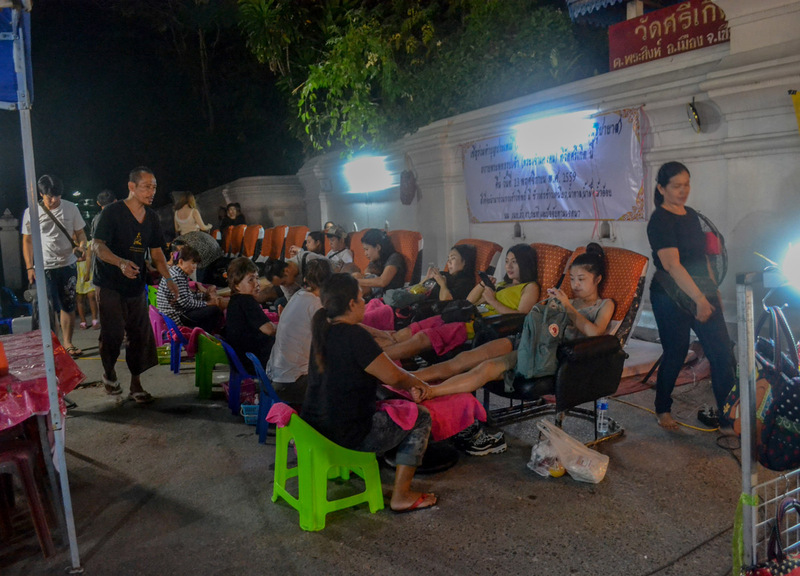 Also, the roadside foot massages work well for bored men who are forced along on a unwanted shopping excursion. After a night out to a night market, you will be desperate to escape the crowds of the city. Wat Umong is a forest temple found still relatively central to Chiang Mai and it’s an easy excursion being just 15 minutes outside of the old city walls (depending on traffic). The temple is found in a serene forest where there’s a whole load of statues, shrines and interesting tidbits throughout the compound. 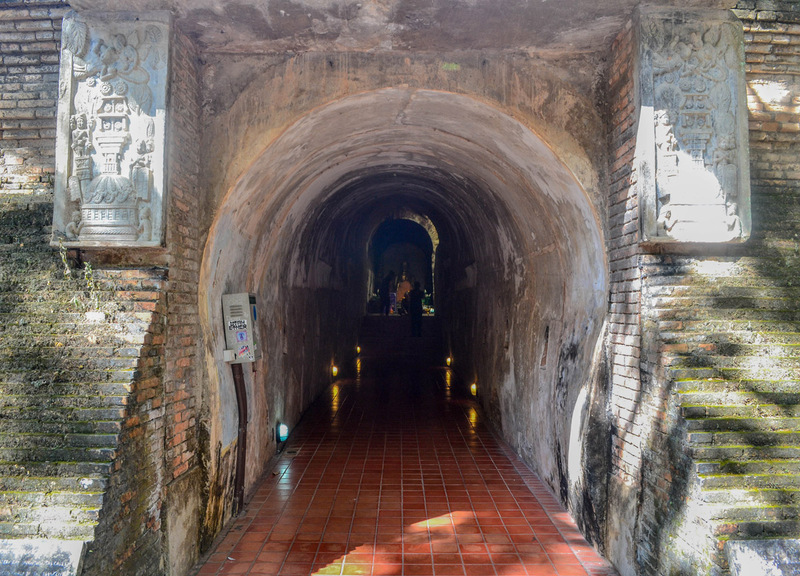 The central attraction however would be the towering stupa which sits above underground tunnels which are inlaid with wall paintings and houses some of the more sacred Buddha statues of Wat Umong. There’s also a large and somewhat serene lake next to the temples where you can feed fish, turtles and, for some reason, pigeons. To get there it’s around 40 baht by Songtaew or 100 baht by tuk-tuk or taxi. Wat Umong Hotels here. Or Wat Phra That Doi Suthep for long. 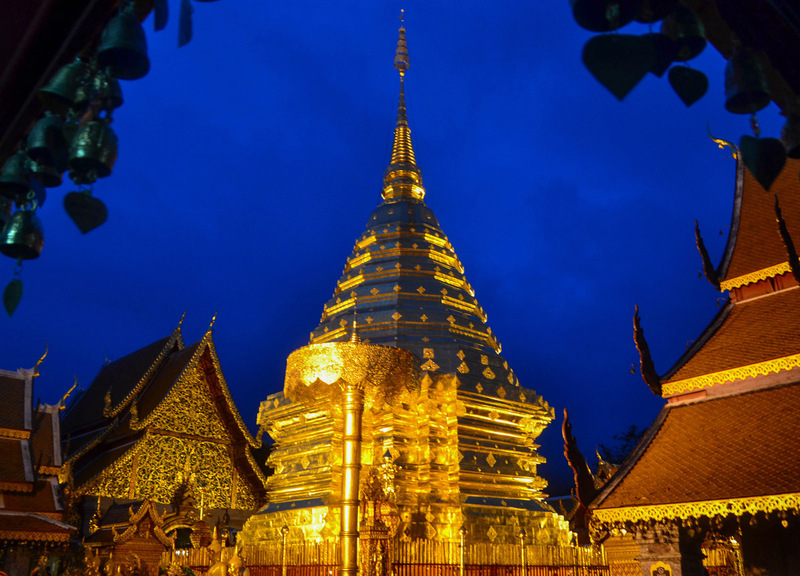 You often hear people claiming that “you haven’t been to Chiang Mai until you’ve been to Doi Suthep”. This is 100% false. 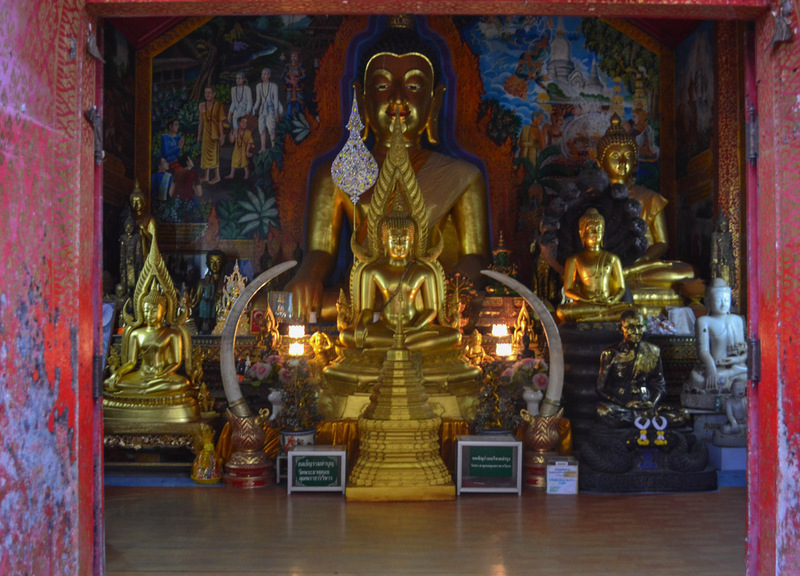 I was in Chiang Mai twice before visiting Doi Suthep. So it is possible but probably not recommended given just the one opportunity. It truly is a magnificent temple. Anyway, before I go further, there are a couple of words you should really know when travelling in Northern Thailand. These are Wat (temple), and Doi (mountain). 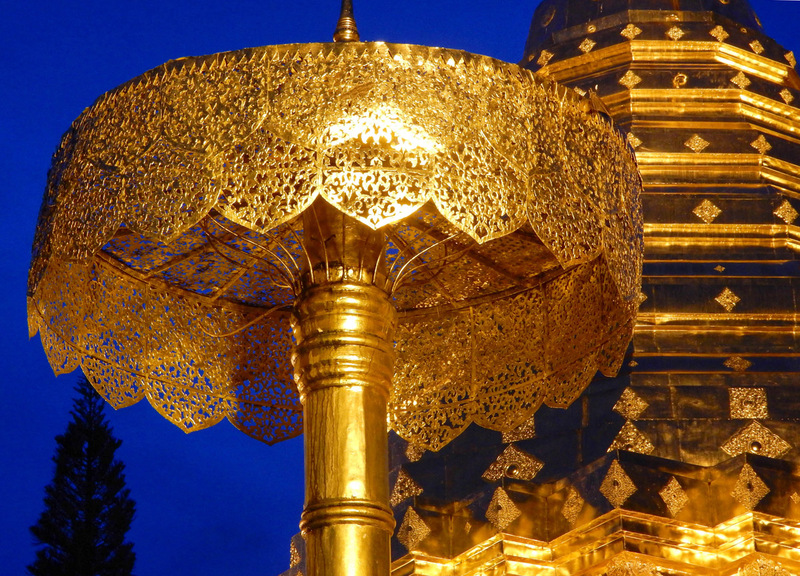 These words will also help explain many of the top attractions in Chiang Mai. So Wat Doi Suthep is a Wat (temple) found on Doi (mountain) Suthep and, while it does sound far out, it isn’t really. A return tuk-tuk journey should be no more than 400 Baht. The best times to visit are in the early morning, with mountain mists, or early sunset, when illuminated with soft spotlighting. Doi Suthep Hotels here. 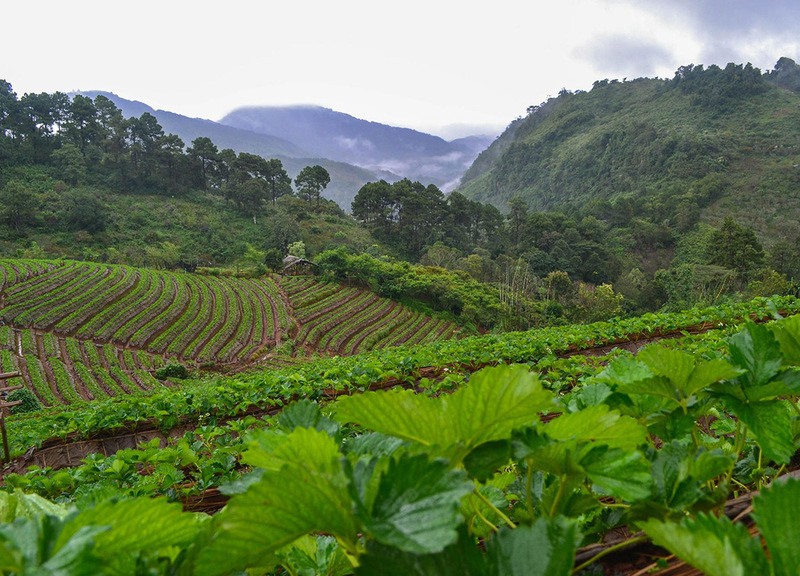 This would be one of the closest districts to central Chiang Mai (about an hour out) and it’s ideal for those looking some more extreme sports and outdoor adventure. This includes things like ATV and off-road tours, canopy walks, zip-lining and whatnot. All things I have no interest in, so I can’t really advise. But it is a nice area and we’ve stayed here a couple of times just because it is so easy to reach. 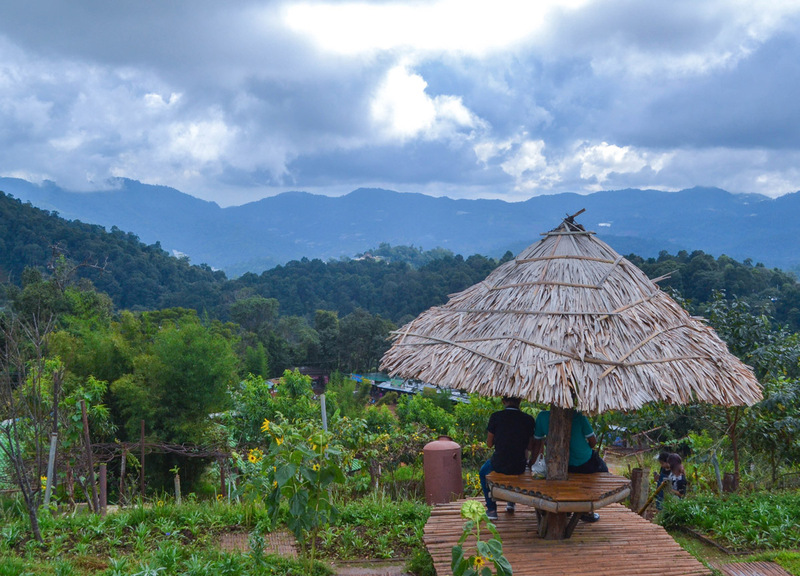 On our most recent visit we did explore more and this took us to the highest mountain peak in Mae Rim called Doi Mon Cham which is a surprisingly popular destination with locals for its mountain views and unlikely agriculture (cabbages). There are also many waterfalls and riverside restaurants and some of the bigger name hotels and resort can also be found in this area. Mae Rim Hotels Here. Mae Taeng is really quite similar to Mae Rim when ot comes to distance, scenery and tourist attractions. 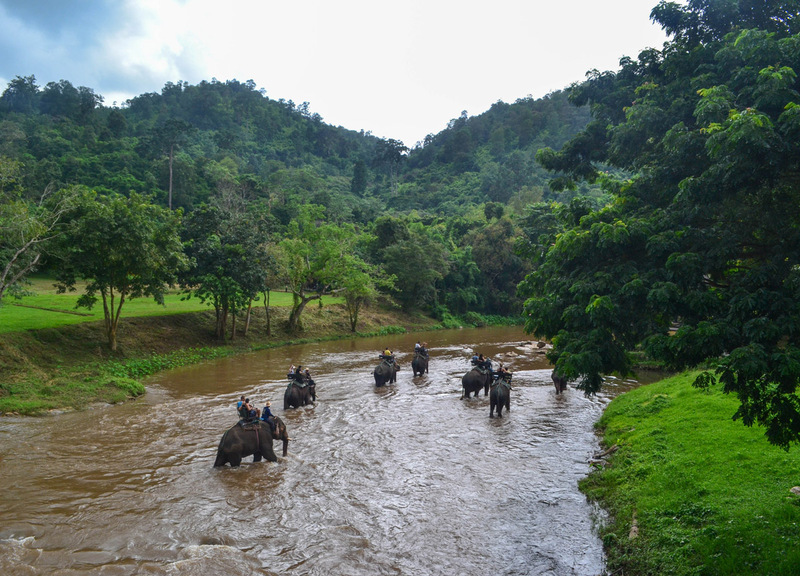 Although Mae Taeng does seem more focused on its elephant camps and hill tribe museums. While I would never promote either of these, I won’t deny they exist either, as they’re probably the most peddled tourist attractions in Chiang Mai. But, on our last visit, we opted instead to stay nearby these attractions in a resort called Sibsan which pretty much backed onto the elephant trek routes and shared a road with the hill tribes. So we still managed to steal a glimpse of the majestic elephants on passing which to be honest felt quite romantic. At least the pain and suffering is masked from afar. Anyway, I wouldn’t put any money into the cruel practices and, while I have paid for both in the past, I do now regret doing so. There isn’t really any enjoyment in them, whatsoever. Mae Taeng Hotels here. 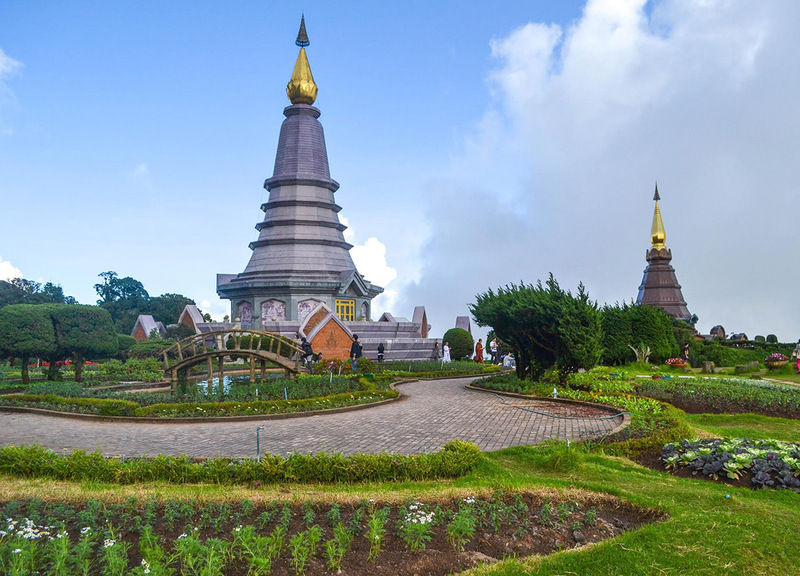 Often dubbed the roof of Thailand, Doi Inthanon is the highest peak in the country, which is even known to get frosty at times. It’s also easy to reach from central Chiang Mai (roughly 2 hours out) and can be included in a daytrip from the city. On our last visit we even started with a 40 minute drive in the wrong direction, to Giant Cafe (to drink coffee up a tree), and still had time to explore Wachirathan Waterfall, and the twin Pagodas near the mountain’s summit. 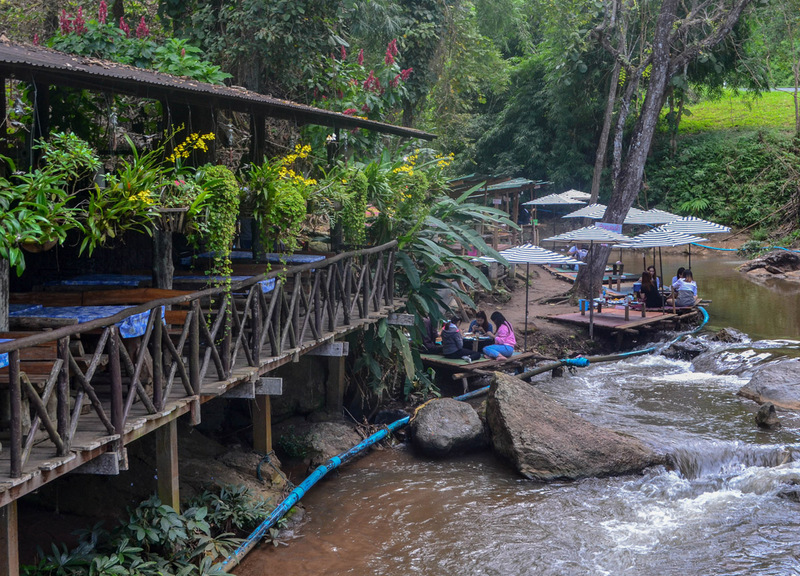 But it is inifinitely more fun to stay overnight in Doi Inthanon and there are camping, chalets and homestays scattered throughout the National Park. In and around expect to find waterfalls, hiking trails, caves viewpoints and lots of natural beauty. 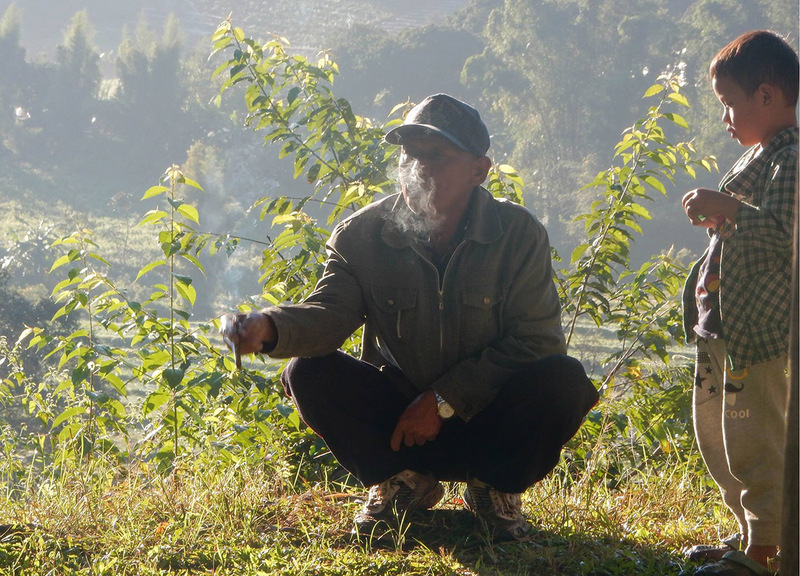 Note, be advised to bring warm clothes to Doi Inthanon, and Thailand’s other higher peaks, as the weather can get nippy at times. This goes more so for winter times (Dec – Feb) and overnight stays. Doi Inthanon Hotels Here. 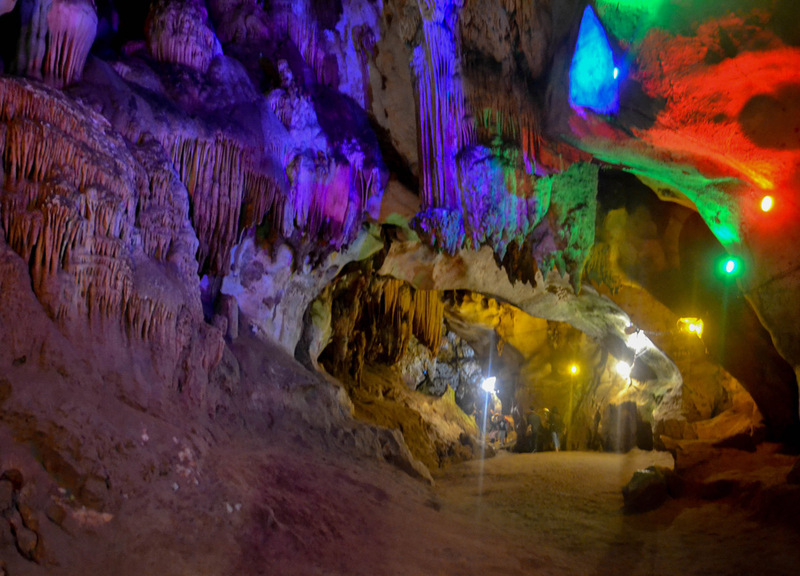 Just past Mae Taeng district we find Chiang Dao which is famous for a whole bunch of reasons including Chiang Dao which is a fascinating (and surprisingly big) cave dotted with Buddhist shrines. Alone worth the visit. 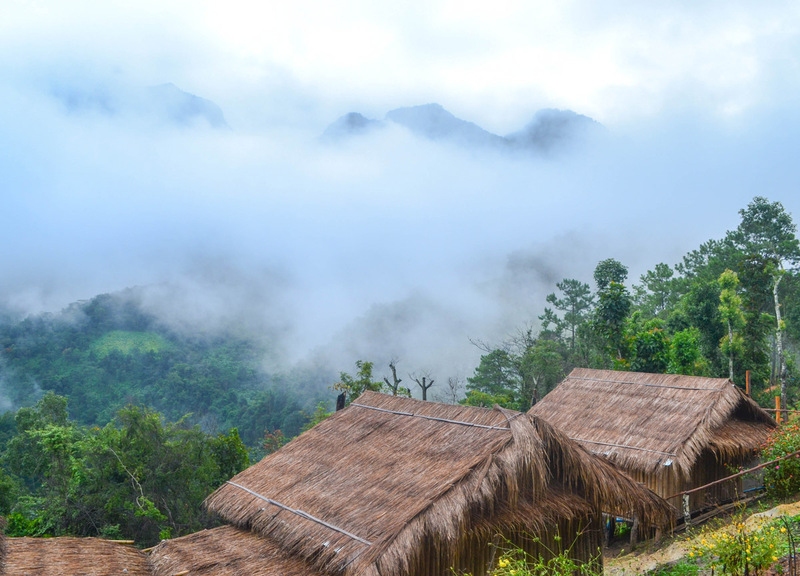 But the real attraction in Chiang Dao has to be the Talay Mok, or sea of fog, which climbs down and around the valley beneath Doi Luang Chiang Dao. This is what we travelled for recently but didn’t get much luck. Duirng our stay in Chiang Dao we spent the night in a hill tribe homestay (Baan Mok Tawan Chiang Dao) which overlooks the highest peaks of the mountains. The following morning we expected to wake to the sea of fog beneath but his time we were actually in the fog. Just surrounded by thick cloud which was a unique experience in itself. 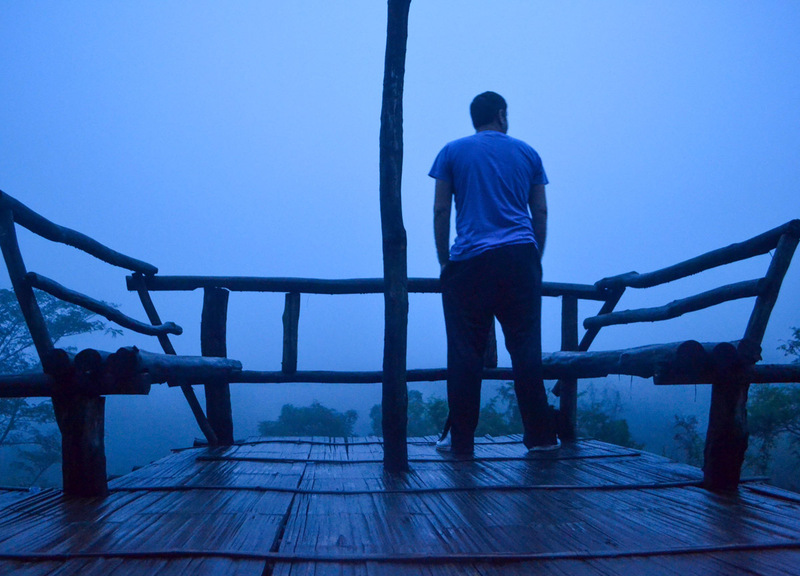 While we did miss the mountain backdrop, we still felt the journey was worthwhile (and we have seen something similar further north at Phu Chi Fa, Chiang Rai). 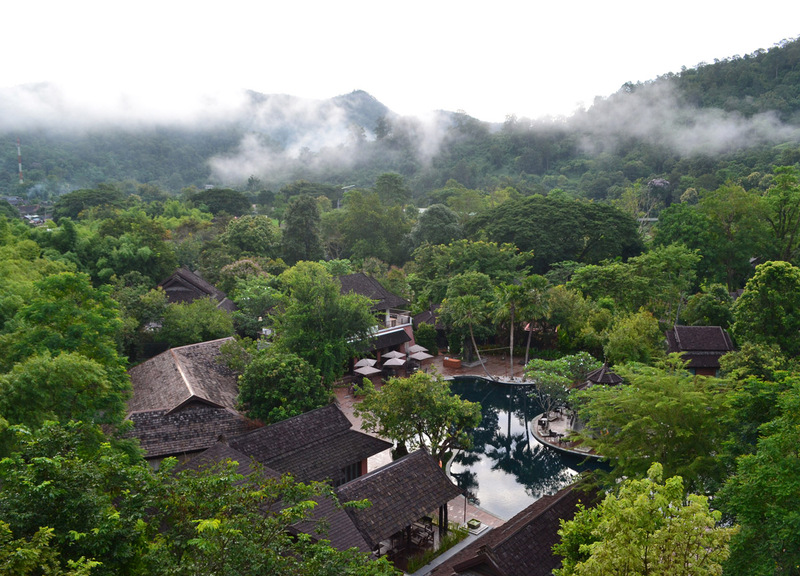 Chiang Dao Hotels Here. 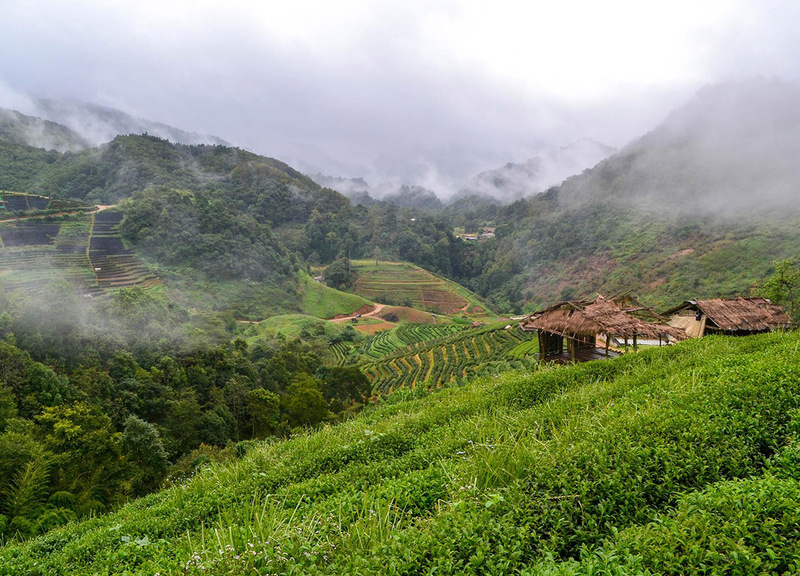 Doi Ang Khang is found straddling both sides of the Thai-Burmese border and is well known for its cool climates and unlikely agriculture. It was also big in the opium trade at one time until the King turned up with agricultural alternatives for local hill-tribes who live there. Now it’s all strawberries, tea gardens and, the local favourite, cabbages. Domestic travellers love them cabbages. There are also a number of attractions in Doi Angkhan, including the King’s Royal Agricultural Station which highlights much of the above. But what I personally found fascinating was the somewhat forgotten hill tribes of these border regions, a mix from Burma and Yunnan, and just how these unique and unexpected cultures contrast with typical, traditional life in Thailand. 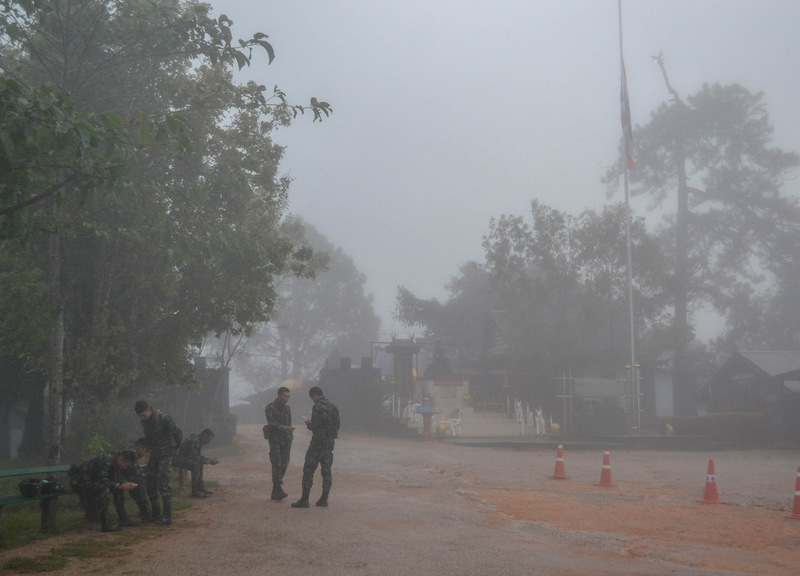 The borders at Baan Nor Lae also feel somewhat unworldly with check points, armed soldiers and lingering mists. It really is a fascinating part of the world to explore. Note, as we found out, it can be hard to get there. Hotels Near Doi Angkhang.